Jim Nolan is young, unemployed, used to being poor, used to being kicked in the teeth, used to being used. He’s stuck in this cycle of despondency and nobody seems to care. But in Southern California in the mid 1930s he’s not the only one who feels that way. Jim’s late father was an active communist, and it’s towards the Party that Jim looks now. He starts by just typing up letters for them, helping with the organisation. They’re testing him out, checking he’s not one of the poor guys desperate enough to take police money to spy on them. Jim is soon taken under the wing of a savvy older organiser called Mac. Mac is a charismatic leader who goes into areas where there is already unrest amongst workers to try and foment a strike. For a strike to work it needs to be keep within the law, and not just be an angry rabble venting their fury at their employers. It has to be directed in such a way as to attract sympathy from locals, rather than their contempt. Mac knows all the dirty tricks landowners and the police use, such as shutting down strikers’ camps on public hygiene grounds, or trying to provoke men into violence so that they can crack down hard, or sending in infiltrators to sow seeds of discontent and get the strikers fighting each other instead. Jim and Mac see all this happen when they stir up a strike amongst apple pickers. The orchard owners have been slashing wages whilst dumping stock in the river to try and drive up prices. It doesn’t take much for the pickers to become picketers. But as the strike descends into violence and arson, and appears to be on the verge of running out of control, Jim realises Mac is only looking at the bigger picture. Mac’s long term plan means winning or losing this particular battle might not even matter, because both success and failure could attract more people to the communist cause. Here John Steinbeck is trying out some of the themes and ideas he later went back to in The Grapes of Wrath. This is a more political novel than that one, but at the same time, his focus here is the people behind the politics. The message is just the same, however: people either get caught up in or left behind by events bigger than themselves. There’s a prototype for Tom Joad in Jim Nolan too. He’s idealistic enough to be swept up by Mac’s folksy rhetoric and simplified arguments, and passionate enough (or perhaps just desperate enough) to be inspired to direct action. 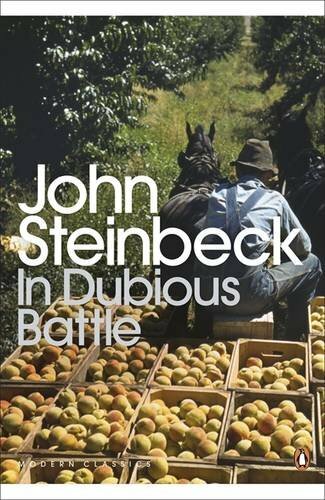 Steinbeck was variously accused of being a ‘Red’ or attacked for not being one, depending on who was doing the attacking, but this novel is a clear indication of his true – moderate – politics. His sympathies lie with working men and those who fight for their rights, but he is also acutely aware of how easy it is to pervert good intentions. Mac’s concern for the labourers may be entirely genuine, but he is so obsessed with the bigger picture that the individuals he corrals are, by his own analogy, not much above the level of dogs. Dogs accept their lot because they don’t know any better, after all, but nobody blames them for their lack of ambition. So Steinbeck got attacked from both sides for this one – for being sympathetic towards strikers, but also for painting a portrait of the simmering labour movement that is less than rosy, let alone Red. It’s not as good a novel as The Grapes of Wrath, nor as monumental as Of Mice and Men, but In Dubious Battle deserves to be better known than it is. Mikey has suffered from agoraphobia for years. He’s long sought the sanctuary of his wardrobe, retreating to the darkness and the quiet whenever things get too much, but now he’s fifteen he’s getting a bit too big to fit in there. His parents struggle to remain patient. His psychiatrist maintains he’s making progress but has run out of suggestions. Only Mikey’s younger but rather precocious sister Meggie is completely unfazed by Mikey’s problems. It’s Meggie who encourages him to push himself, to come with her to the local funfair, and to then spend time on his own. And he does it. But when he’s alone he witnesses something he wishes he never saw, and more importantly, the gang doing it witness him witnessing them. They know who he is, and they know where he lives. It’s going to take more than a wardrobe to keep him safe from them. 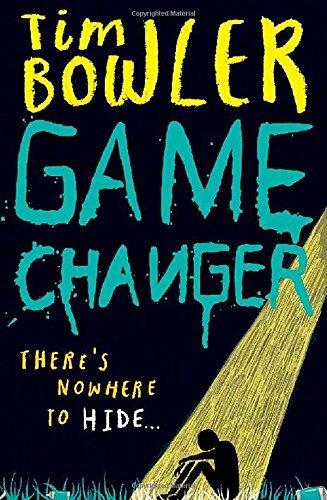 Tim Bowler avoids writing an issue-of-the-week sort of novel by wrapping up Mikey’s problems in a fast-moving, suspenseful thriller. There’s no time to stop and explore how Mikey can cope with various situations (let alone overcome them) because the story starts in the middle of the action and goes off at a running pace from the first page. It takes a long time to discover precisely what it is Mikey witnessed before that first page – perhaps a little too long. The entire novel pivots on the fact that Mikey knows something that we don’t, and he won’t tell anyone (not even Meggie). Bowler stretches that mystery until it almost snaps, relying on the strength of his characterisation of Mikey to carry us through until the big reveal and a final confrontation.